On the 8th (Tue), admire the landmark architecture of The Company of Jesus Church, don't miss a visit to San Blas, then steep yourself in history at Sacsayhuaman, and finally contemplate the long history of Plaza de Armas. Rio Branco, Brazil to Cusco is an approximately 16.5-hour car ride. You can also fly. Traveling from Rio Branco in October, you will find days in Cusco are slightly colder (24°C), and nights are colder (7°C). Finish your sightseeing early on the 9th (Wed) so you can travel to Lima. Kick off your visit on the 9th (Wed): surround yourself with nature on a nature and wildlife tour, then wander the streets of Barranco, and then tour the pleasant surroundings at Circuito Magico Del Agua. On your second day here, take in the architecture and atmosphere at Iglesia y Convento de San Francisco, ponder the design of Plaza de Armas (Plaza Mayor), then explore the ancient world of Huaca Pucllana, and finally don't miss a visit to Miraflores. 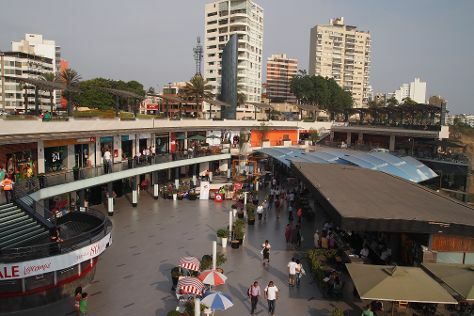 For ratings, photos, reviews, and more tourist information, you can read our Lima trip planner . Getting from Cusco to Lima by flight takes about 2 hours. Other options: drive; or take a bus. Traveling from Cusco in October, Lima is a bit warmer at night with lows of 19°C. Finish up your sightseeing early on the 11th (Fri) so you can travel to Huaraz. Explore the numerous day-trip ideas around Huaraz: Chavin de Huantar (Chavin National Museum & Archaeological Site of Chavin) and Lake Churup (in Huascaran National Park). Make the 11th (Fri) a memorable day with a climbing tour. Next up on the itinerary: look for all kinds of wild species at Callejon de Conchucos, see the interesting displays at The Archeology Museum of Ancash, contemplate in the serene atmosphere at Iglesia La Soledad, and stop by RUBRIX. To see maps, photos, and other tourist information, use the Huaraz online trip planner . You can fly from Lima to Huaraz in 2 hours. Other options are to drive; or do a combination of flight and car. Expect a bit warmer weather when traveling from Lima in October: highs in Huaraz hover around 28°C, while lows dip to 8°C. Wrap up your sightseeing on the 14th (Mon) early enough to travel back home.